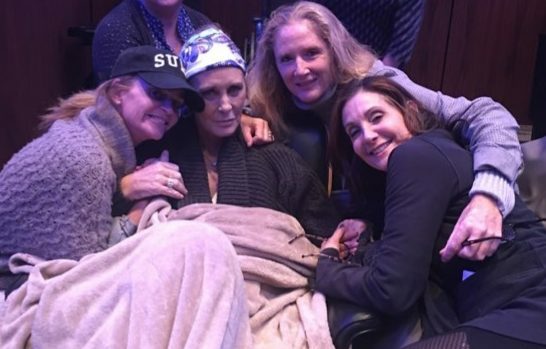 Nancy Anderson, a 58-year-old former therapist and current patient of Regional Hospice and Palliative Care in Danbury, CT, (regionalhospicect.org) was eagerly awaiting the premier of the movie “A Star is Born.” As one of her all-time favorite movies, she couldn’t wait to experience it all over again. The challenge, however, is that Nancy was recently diagnosed with advanced pancreatic cancer, which makes ordinary things, like a trip to the movies, much more difficult to do. When her Regional Hospice care team learned of Nancy’s desire, they sought to help make her wish come true. They contacted the Prospector Theatre, a unique non-profit movie house in nearby Ridgefield CT to see if they could work together to create a special screening of “A Star is Born” for Nancy. The theatre management immediately signed up to make this dream come true, promising to add “a little bit of Prospector sparkle” to brighten her day. On October 17th, the Prospector team hosted a private screening of the movie for Nancy and her friends. Under the projected stars on the ceiling, they set her up with a special lounge chair, refreshments, and blankets. In the comfort of this setting, Nancy and her friends were given a few hours of pure joy, as they settled in to watch this special movie. According to her friend, Jami, Nancy was grateful to take some control of her life back: to invite her friends and to go out to see a movie of her choosing. It was a blessing for them all during a difficult time, described by her friends as a beautiful, but bittersweet day.